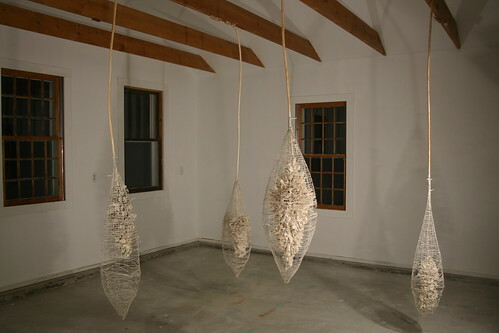 Rebecca Hutchinson builds delicate biomorphic forms out of fragile unfired paperclay, hangs them in an art gallery, and then destroys them after the show. Many of them look like ant nest casts or caterpillar cocoons, but what they really remind me of are small creatures known as larvaceans. Larvacean in lab: srsly without hap. Larvaceans are tiny hapless tadpole-like things that live by the zillions in the open ocean, constructing elaborate "houses" out of mucus which they use to filter particulate matter. They were a source of frustration to marine biologists on plankton surveys, mainly because instead of dancing happily with their fellow planktonic pals under a dissecting microscope, they expired rather quickly inside their pea-sized tomb of slime. During an expedition in 1971, Alice Alldredge took up these hard-to-study creatures. But her suggestion to observe them in their natural habitat was met with blank stares, as the scientific culture at the time was stodgily laboratory-based. Undaunted, she launched herself into the warm waters off the coast of Bimini, tethered herself to an anchor and waited, trying to get a glimpse of larvaceans in their natural habitat. She didn't have to wait long. Larvaceans in ocean: Can you handle their combined hap? You cannot. Not only were they everywhere, but their mucus houses were larger and more refined. It seemed that the act of dragging plankton nets into the lab ruined their tiny structures, and only by watching them in their natural environment could one get the full effect of their intricacies. Furthermore, once the mucus-houses get filled with particulate matter, they are quickly jettisoned, and the larvacean builds another. Alldredge used her observations to help make groundbreaking studies on how sinking larvacean houses form an important part of the abyssal ecosystem, studies that were only possible by stepping out of the lab and diving into their ephemeral world. 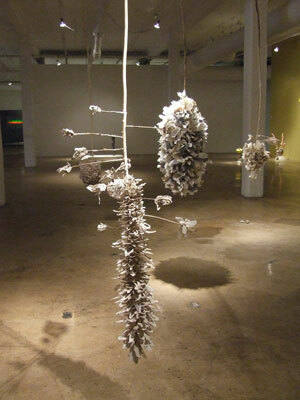 "Sile Bloom" by Rebecca Hutchinson, 2009, Clay and mixed media. Unlike so many sculptures that are built to last eternally in collections and museums, the paperclay forms crafted by Hutchinson are temporary and ephemeral. Once the artist gives up the idea that these forms will last, they cease to become an object and instead become a visible verb caught in the act. And the only way to really experience structures like these is to dive in and float amongst them, before they sink away into the abyss. This entry was posted in art, science and tagged Alice Alldredge, larvacean, plankton, Rebecca Hutchinson, sculpture. Bookmark the permalink. Whoa!! I have never expected mucus to look so lovely, nor to function as a reminder to be flexible in one’s approach. And who can blame the wee beasties for failing to thrive when they all get abducted to an alien laboratory?